You’ll need some rocket seeds and some potting mix. Mark out a square in your garden bed about 30cm x 30cm, remove any weeds and water it well. Spread a layer 1cm thick of potting mix. Make sixteen equally spaced indentations (4×4) with your finger, about 1/2 cm deep. Sow two seeds in each dip. I don’t cover the seeds. Water very gently – a hand mister is good. You might need to protect from birds and cats with netting. Within a week your rocket will appear. If both seeds germinate in one position, pinch out the weakest. Don’t try to pull it out or you’ll disturb the one you want to keep. Don’t worry if you don’t get a plant in all sixteen spots as the others will fill the gaps as they grow. Keep the area moist. Pick the biggest leaves regularly to encourage more growth. You can use a large pot or a planter filled with potting mix if you prefer. Sow another square in a week’s time. All my top seven winter crops can be grown this way. This is based on the Square Foot Gardening method. Try some rocket ‘runway‘ – halfway between wild and cultivated rocket. 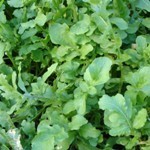 It’s more peppery and serrated than normal rocket and slower to go to seed. When it does go to seed, it ‘seeds freely’ meaning you’ll never have to sow it again.